It was awesome to get back to the Great Pacific Northwest to climb Mt. Rainier again. This is my third summit of Rainier and it was a beautiful day on the top. My previous climbs have been as a private climber so this was my first time going with a guide outfit like RMI Expeditions. Since we had some first time climbers with us, our first day was Mountaineering School. We hiked up to a snowfield and practiced self arrest, walking in crampons and other mountaineering skills. 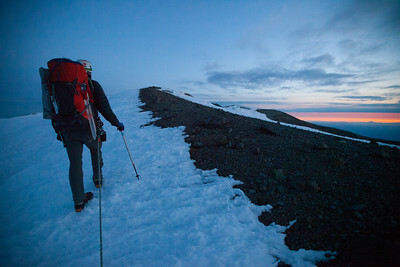 The next day we hiked all our gear up to Camp Muir at 10,000 ft. After lying down for a stint from 6pm to 11pm we geared up and made a push for the summit.